Union HRD minister Smriti Irani is in the news again. But as our chaiwallah-turned-prime minister unfurled the national flag from the Red Fort on August 15, it is relevant for critics to bear in mind that Indian democracy was designed to engineer the rise of the common man. Indian lawmakers who rise from humble origins may not possess college degrees and might not be intellectually equipped to answer brainy questions from journalists educated at the universities of Delhi and Yale. Democracy rose through 5th-4th centuries BC when the Athenians revolted against their tyrants and established their own rule, but as a system of government it was soon lost. Through the 16th and 19th centuries, a movement of democratic ideas known as Enlightenment flourished in Europe, giving birth to the American and French revolutions. In his book Revolution of the Mind, Jonathan Israel observes that the Enlightenment was “quintessentially defined by its insistence on full freedom of thought, expression, and the Press, and by identifying democracy as the best form of government”. As democracy matures, it strikes at the hereditary sources of power. In future, Indian democracy will propel milkmen, drivers and mechanics to power frequently; they will make mistakes and might not differentiate a degree from a certificate. India’s tainted political class needs to treat them with humility and respect their life’s journeys through which they overcome inherited handicaps to become the wheels of the Republic. 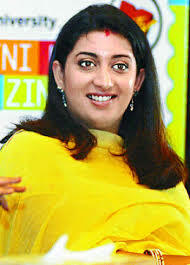 At the India Today Woman Summit 2014, Smriti reiterated her oath to uphold the Constitution. Birthed by Indian democracy, the former cosmetics girl is freedom’s daughter. If Smriti erred in her affidavits, it was a legal mistake and can be dealt with by the courts — or by our large hearts. The media is haranguing her because she belongs to the opposite political camp, is telegenic and speaks fluent English. A debate centred on degrees obscures her achievements. The television series she acted in are worth PhDs in sociology. Her life’s trajectory through the rigours of politics is inspiring. It is time a British university handed her an honourary doctorate in recognition of her life’s experience as an actress and lawmaker. India has entered a transformative moment: Its democracy is engendering multiple turning points in the life of the aam aadmi. Indian democracy’s first half century nurtured institutions of governance, the next half will cement the aam aadmi’s sovereignty over its political institutions. This entry was posted in Article, news and tagged Smriti Irani, Smriti Irani's political ascent is not cosmetic. Bookmark the permalink.